As youngsters, we are taught that we can do anything we want so long as we put our minds to it. However, there are costs associated with obtaining the things we want. Sometimes the cost is sacrificing something; sometimes it is suffering through a bad time or postponing an ambition. In short, costs are not always associated with money, but there is always a price to be paid. 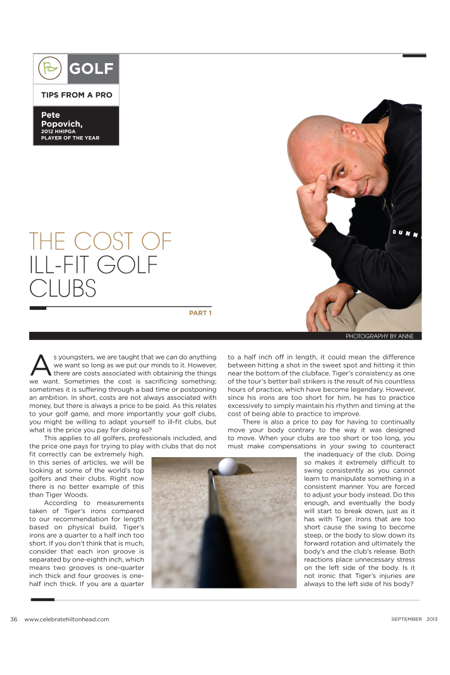 As this relates to your golf game, and more importantly your golf clubs, you might be willing to adapt yourself to ill-fit clubs, but what is the price you pay for doing so? This applies to all golfers, professionals included, and the price one pays for trying to play with clubs that do not fit correctly can be extremely high. In this series of articles, we will be looking at some of the world’s top golfers and their clubs. Right now there is no better example of this than Tiger Woods. According to measurements taken of Tiger’s irons compared to our recommendation for length based on physical build, Tiger’s irons are a quarter to a half inch too short. If you don’t think that is much, consider that each iron groove is separated by one-eighth inch, which means two grooves is one-quarter inch thick and four grooves is one-half inch thick. If you are a quarter to a half inch off in length, it could mean the difference between hitting a shot in the sweet spot and hitting it thin near the bottom of the clubface. Tiger’s consistency as one of the tour’s better ball strikers is the result of his countless hours of practice, which have become legendary. However, since his irons are too short for him, he has to practice excessively to simply maintain his rhythm and timing at the cost of being able to practice to improve. There is also a price to pay for having to continually move your body contrary to the way it was designed to move. When your clubs are too short or too long, you must make compensations in your swing to counteract the inadequacy of the club. Doing so makes it extremely difficult to swing consistently as you cannot learn to manipulate something in a consistent manner. You are forced to adjust your body instead. Do this enough, and eventually the body will start to break down, just as it has with Tiger. Irons that are too short cause the swing to become steep, or the body to slow down its forward rotation and ultimately the body’s and the club’s release. Both reactions place unnecessary stress on the left side of the body. Is it not ironic that Tiger’s injuries are always to the left side of his body? Other ill effects of clubs that are too short are shots high to the right, i.e. trapping and blocking the ball, and the occasional snap hook. The blocks come because the body slows down its forward rotation. (If it were to continue its forward rotation at its current speed, it would hit the ball thin, because the club was too short.) Now, because the body slows down, it then has to pick its speed back up to continue the swing. In between this starting and stopping, impact and release are compromised and the common result is a limited release of the body, arms, and club head, so the ball goes high right. Do this enough, and the brain tells the body to force the release by manipulating the club; due to the club’s short length, the result is a quick hook. Doesn’t this also sound familiar to Tiger’s misses? Because golfers swing their irons three to four times more than they swing their woods, their woods will be affected even more intensely by poorly fit irons. In fact, Tiger continually changes the shaft on his driver without success. Once again, it is the ill-fitted length of his irons that cause his driver to be the worst club in his bag. Because he rarely, if ever, has a complete release of his body, arms and club, he is limited in his ability to hit a controlled draw, especially with his driver; being unable to control a draw, he must rely on a fade. Tiger has been through three swing changes in his career, searching for a cure to his problems so he can reach the point of owning his swing. You would think by now it would dawn on someone in the Tiger camp that swing mechanics are not the problem since he has mastered three different swings from three different teachers yet continues to struggle with the same problem. As Tiger ages, a number of things will happen: his responsibilities as a parent will reduce his practice time, and with less time to dial in his timing because of ill-fit clubs, he will continue to struggle with consistency, or at least the consistency he longs for. His timing will also wane due to the aging process of the body. Both do not fare well for him. Many people say golf is a game of inches and often relate to the six inches between the ears. There is no doubt that Tiger is as good between the ears as any golfer to ever play the game. However, it is a shame that, in his case, golf improvement is not a game of inches but of less than that—perhaps even as little as one-half or one-quarter inch. The “cost” to Tiger is repetitive damage to his body as he attempts to counteract the effect of misfit clubs in an effort to consistently hit the ball. Another effect of clubs that are too short is getting too steep at impact and/or excessive dropping down of the body (crouching), both of which plague Tiger. The price he must pay is being unable to perform at his potential. No matter what a golfer’s ability, that ability cannot be realized without properly fit clubs. It applies to the world’s best and it also applies to the rest of us who play this great game. We at the GPA-HHI have one of the most detailed fitting programs to be found and welcome the opportunity to both fit you to your clubs and help you play better golf. 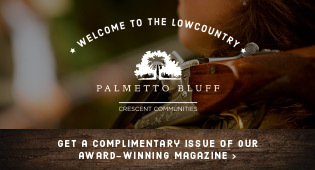 For a fitting, a lesson or both call us at (843) 338-6737 or emailpete@golfacademyhiltonhead. Tips from a Golf Pro: Club Fit or MisFit?